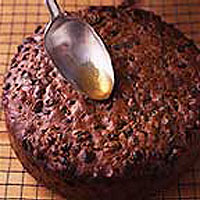 100ml brandy, plus extra for "feeding"
Grease a deep, 20cm, loose-based cake tin. Cut 2 circles of baking parchment to fit the base. Cut a double strip of parchment to fit around the inside of the tin, making it 2.5cm wider than the height of the tin. Make a 2.5cm fold along the length of that strip, then cut from the edge to the fold at 2cm intervals. Put one circle of parchment in the tin, then press the strip around the inside. The snipped section will flatten on to the base of the tin. Place the second circle of parchment on top. Put the butter, sugar, dried fruit, cherries, orange zest and juice and 100ml brandy into a pan. Heat gently until the butter melts, then bring to the boil. Simmer gently for 5 minutes. Leave to cool for 30 minutes. Mix the remaining ingredients with the fruit. Spoon into the tin and smooth out. Bake in the centre of the oven for 2-2½ hours. If the top gets too brown, cover with scrunched up foil. After 2 hours, test with a skewer to see if it is done - it should come out clean. If not, cook for another 15 minutes and test. Repeat if necessary. When done, cool in the tin for 30 minutes. Remove from the tin, peel off the paper. Prick the top of the cake all over with a skewer. Drizzle over 2 tbsp brandy. Leave to cool completely. Wrap in 2 layers of greaseproof paper and a layer of foil. Put in an airtight container. "Feed" with brandy every 2 weeks until Christmas. It will keep for 2-3 months.